Immunisations are a quick, safe and effective way of protecting your child against a range of serious and potentially fatal diseases. The more children that have immunisations, the lower the chances of a disease outbreak. 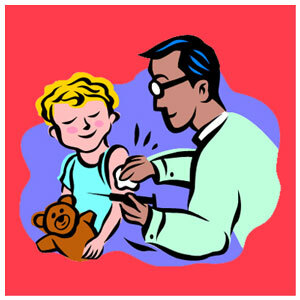 The complete immunisation schedule can be found here. Eight weeks– Six-in-one vaccine (diphtheria, tetanus, whooping cough, polio, Hib (Haemophilus influenza type b) and hepatitis b; Pneumococcal Vaccine (protects against Pneumococcal infections) Rotavirus (a common cause of diarrhoea and sickness) and Men B (Meningitis B). 12 weeks– Six-in-one vaccine (diphtheria, tetanus, whooping cough, polio, Hib (Haemophilus influenza type b), and hepatitis b; and Rotavirus (a common cause of diarrhoea and sickness). 16 weeks– Six-in-one vaccine (diphtheria, tetanus, whooping cough, polio, Hib (Haemophilus influenza type b) and hepatitis b; Pneumococcal Vaccine (protects against pneumococcal infections) and Men B (Meningitis B). 12-13 months– Hib/ Men C booster, MMR (Measles, Mumps and Rubella), Men B (Meningitis B) and Pneumococcal vaccine. Two, three and four years– Annual Flu Vaccine will be offered from Autumn 2014 to children aged two, three and four on September 1st 2014, it is given as a nasal spray. BCG (TB vaccine) is not given routinely, it is offered to a baby who is thought to have an increased risk of coming into contact with TB.